Docker is a popular platform to build, distribute and deploy portable applications, based on container technology. Application containers are one of the most important components of the cloud platform, allowing to quickly provision and deploy running applications based on images to a variety of targets: compatible cloud infrastructures, on-prem, bare metal. This tutorial uses Mac OS X 10.10 Yosemite, but you can follow similar steps for Windows. 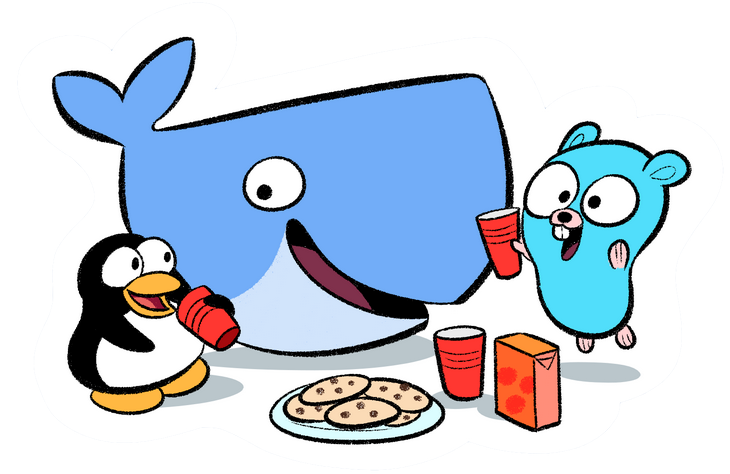 Linux doesn’t avail of a GUI installer, but you can easily install Docker via apt-get or yum. Note that the Docker website is undergoing some major restyling so the screenshots may differ from the actual pages. 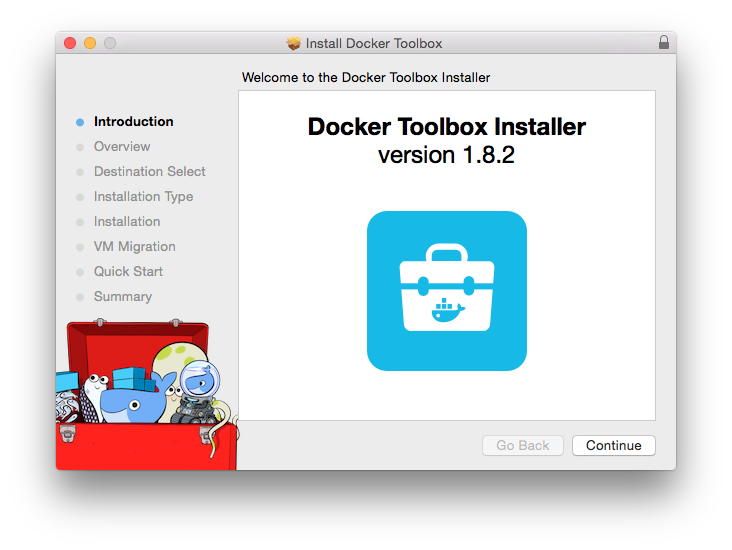 Download and install the Docker Toolbox. This will install the Docker Quickstart Terminal, the Kitematic GUI client, the docker command, and a few other utilities. 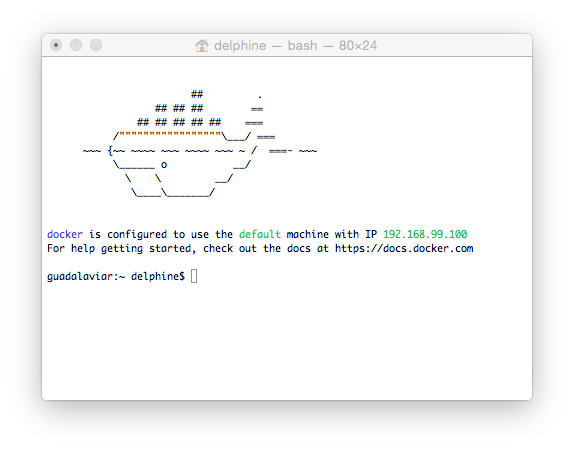 Now that we’re ready to work with Docker, we can launch the Docker Quickstart Terminal and run our first image. There are two types of images: “official”, and contributed. Official images are made available by trusted vendors on Docker Hub, sort of an App Store for Docker images. You can find images for pretty much anything you may want to run on a server: Nginx, Mongo, RabbitMQ, but also barebone OS images: Ubuntu, CentOS, and so on. Contributed images are published by organizations like RedHat, IBM, Oracle, or ordinary users. library/ubuntu:latest: The image you are pulling has been verified. Important: image verification is a tech preview feature and should not be relied on to provide security. As you can see, Docker is trying to find a local image first. Images are cached locally for performance. In this case, we’ll have to download it from the Hub. Once downloaded, the image is loaded into a container and run, the command echo is executed with the argument “hello world!”. After that, the container is terminated. Running the shell keeps the container alive until we terminate it with the exit command. The -it flags wire the container’s terminal and stdin to our terminal, so we can interact with it. Note that the Ubuntu image is very barebone. If you need programs like vim or less, you’ll have to apt-get them. The coolest aspect of Docker is that it lets you compose and build images at will, in order to create complex images that can be provisioned on the fly to power applications for your specific needs. The Dockerfile is the equivalent of a Makefile to build a Docker image. You can reuse existing images and specialize them, by installing applications, running commands, or deploying files. Let’s specialize the docker/whalesay image that comes with the Docker tutorial, to display the output of the fortune command. 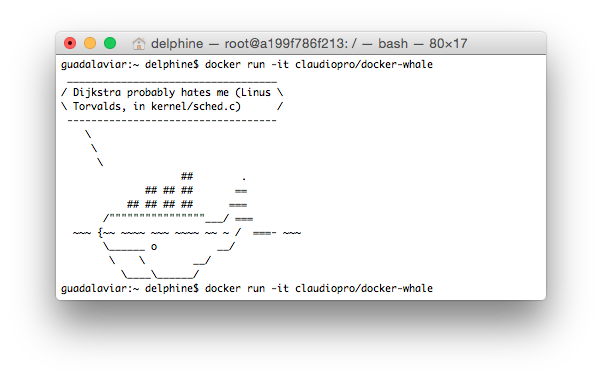 The docker/whalesay image is a Ubuntu distro with a custom build of the cowsay program that displays Docker’s whale instead of the usual cow. 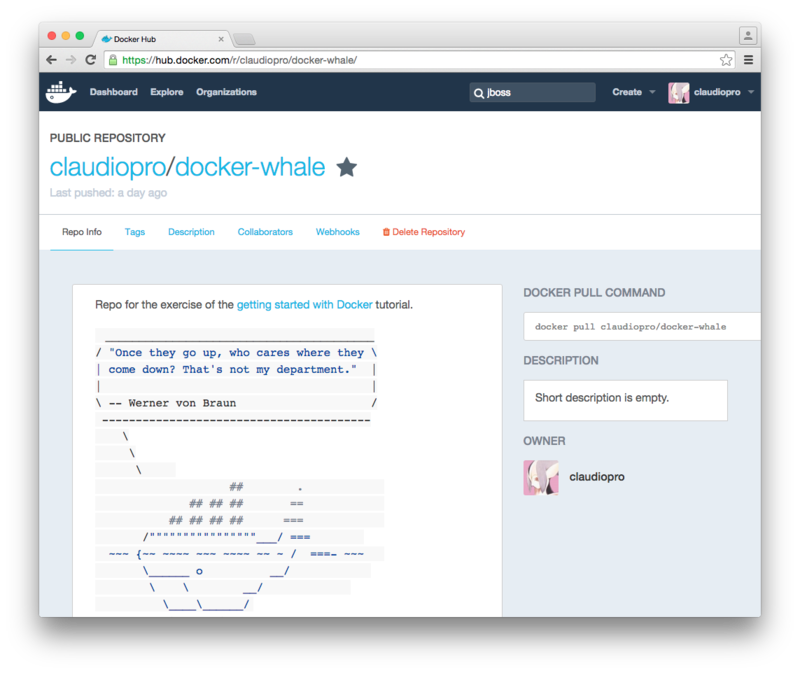 Now that we built the docker-whale image, we are ready to publish it to Docker Hub. To publish images to the Hub, we’ll have to sign up for an account first, but worry not: it can be created free of charge. I recommend the brilliant Self-Paced Training by Johnny Tu available on the Docker website. It is divided in three parts: Introduction, Fundamentals, and Operations. Each tutorial lasts around 1h, so they can be easily fit into a lunch break or the evening. Full stack web developer with a keen interest for the open web platform, privacy, security, and IoT. Former Amazonian, former IBMer. All views my own.